Imitation is often referred to as the sincerest form of flattery, however the attempt by the Treasury to mimic the success of Census Australia's lighthearted Twitter approach demonstrates how carefully agencies must consider their social strategies in light of public opinion. Many will remember when the ABS launched its Census Twitter campaign with an engagement styled to help make census numbers relevant to the average Australian using humour and cleverly written tweets. The @2011Census account (now @CensusAustralia) attracted enormous public and media attention across Australia and internationally, and there was a significant increase in Census completion rates (though a number of initiatives would have helped contribute to this). The ABS even went so far as to 'Rickroll' its followers, a sign of a government agency so comfortable with its own communication and audience that it could engage them playfully and without fear. It was a brilliant strategy (well done Michelle), breaking the mold for government social engagement. Now The Treasury is attempting a similar strategy on Twitter, however is receiving a very different reaction and engagement from the public. The Treasury is a relative newcomer to social engagement, having first tweeted in July 2012. Being one of the more formal and less public-facing government agencies it took longer for The Treasury to make a decision that a social presence was safe and needed to support its external engagement activities. However when it leapt into social, it did so with both feet, using Twitter to announce and engage on tax reform consultations and highlight its very important activities, which rarely receive public attention. The agency did suffer some of the usual starting pains of new organisational social users, not using hashtags, avoiding engagement with other users and generally treating Twitter as a broadcast feed resembling a news ticker, however they've grown more interactive of late and look more comfortable on the platform. This year The Treasury has taken an additional step - taking a leaf out of the ABS's book to engage more proactively around the organisation's most significant annual event, bringing down the Australian Government Budget. Using factoids, like the Tweet below, the agency is seeking to engage Australians in a more human and interactive way. Now this is a good thing, and speaks to the growing confidence of the agency on social channels. It's not easy for conservative organisations to 'let go' and allow themselves to engage in less formal and more human ways. However the specific strategy The Treasury is using runs a large risk of backfiring on the agency. The ABS could take a very interactive and light approach with the Census to make it relevant to Australians for the very reason that it wasn't especially relevant to many of them. Few people had strong views about the Census process, either negative or positive. It only occurs once every five years, it has no discernable impact on people's lives the rest of the time and, while completing a census form was inconvenient for some people, it didn't really trigger a strong opposing reaction. Essentially the ABS approach helped make the Census relevant to people, taking it from a position of irrelevance. The Treasury is in a very different position with the Australian Government Budget. The Budget is one of the most significant government activities each year. It is comprehensively covered by the media and is seen as a defining moment for governments, used by the public to judge their performance and their future. Decisions in the budget affect every Australian, often in very personal and direct ways. Some see their lifestyles improve, others see them falter. It is extensively leaked and discussed ahead of its release, and the shockwaves it can send through the Australian economy can profoundly shape how the government and Australia are perceived globally and locally. In the case of the current budget, much of the public still feel wounded from last year's budget, which saw a number of budget measures not passed and the government have to take steps back in a number of areas. The government has taken steps to 'defuse' concerns over the current budget, and have done a good job of leaking key measures ahead of its release to assay some of the community's fears regarding its impact on their lives. However it probably isn't the right environment to replicate the ABS census strategy - the differences in the public's starting views towards Census 2011 and Budget 2015 are enormous. As such it looks to me as if The Treasury has perhaps become too ambitious in its approach to budget social engagement this year - a view that's being supported by the types of comments the agency is receiving on its account. 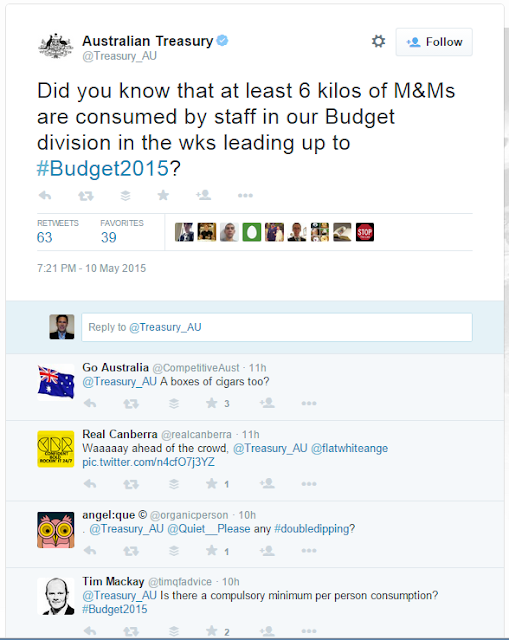 For example, The Treasury's latest tweet deals with the amount of M&Ms consumed by their Budget division staff in the weeks leading up to the budget (image below). While the tweet, coming from the ABS Census account, would likely be well-received, coming from The Treasury it is interpreted in quite a different manner. While it has decent retweets, the responding comments suggest that the agency doesn't (yet) have the same license to be as light and engaging as the ABS. The tweet suggests to me the very public social mistake by Qantas a few weeks after it grounded its fleet. The #QantasLuxury campaign turned into an opportunity for the public to vent their anger. The Treasury is risking a similar backlash to what could be seen as self-indulgent and commercial tweets, such as the one portrayed above. Talking about their staff's consumption of a brand of chocolate treats, or otherwise being light-hearted in engagement is not the best strategy at a time when the public is waiting in trepidation at the impact on their lives from the budget. For the ABS a high engagement, high risk strategy had limited downside, for The Treasury there's far more potential risk and far less reward - although this tweet did get the gong as the most engaging government tweet in Australia for 10 May 2015 from Great Oz Gov Tweets (which I helped establish). It's a bold strategy for The Treasury, and I hope it pays off, but in future the agency need to more carefully consider the environment they operate in and the profile of their subject matter, not simply their own desire to communicate and connect.